Bob Jackson has never been bashful about sharing his opinions. In the past decade, he has openly criticized hunters and outfitters who lure trophy elk and, increasingly, grizzly bears outside the sanctuary of Yellowstone National Park by placing salt licks near the park boundary. "Salt pits are all over the Bridger-Teton Wilderness, including where five bears were killed in Thorofare four years ago," Jackson said recently. "There is no way a bear could even get a half-mile, let alone two miles, from a salt in the entire Bridger-Teton Wilderness." But this past summer, Jackson's open expression of such views came to an abrupt end. On Aug. 30, after 30 years as a backcountry seasonal ranger in Yellowstone, he was handed a gag order by the Park Service and told to sign it or lose his job. Although he believed the edict unfair, Jackson signed to save his job and went back to work patrolling the Thorofare, 500 square miles in the park's remote southeastern corner, along the Teton Wilderness boundary. Hunting season was coming, and he worried about several newly replenished salt licks, some laced with molasses, just outside the park. Soon, Jackson believed, both the new licks and the remains of historic licks would become "killing zones" first for elk and, after the carcasses were quick-quartered and left to rot, for grizzly bears lured by the irresistible combination of carrion and molasses. By Jackson's estimation, hunters leave as much as 30,000 pounds of elk carrion on or near salt licks each fall. The gut piles are so massive and so dependable that some grizzlies apparently respond to the crack of a rifle as they would to a dinner bell. Although the state of Wyoming outlawed the practice last year, Jackson says there's been scant enforcement. So he kept trying to talk with Park Service biologists and state game wardens and forest rangers about the problem. He did not, he insists, take journalists into the backcountry against his supervisor's wishes, and he continued to refer all calls to the park's public affairs office. On Sept. 22, though, Jackson was called out of the backcountry and sent home to his farm in Iowa. The Park Service handed him an unsatisfactory performance review, he says, his first in three decades as a seasonal ranger. "I feel I am being punished for something beyond my control," Jackson wrote in a recent letter to the media. Jackson's predicament worries environmental and public employee activists. "(This gag order is) one of the most overbroad and offensive directives," says Jeff Ruch, director of Public Employees for Environmental Responsibility. "Bob Jackson can volunteer less information than a prisoner of war." While the Park Service remains tight-lipped, some activists worry that the agency is using Jackson as an example to career employees who speak out on issues. Jackson was not always labeled a problem employee. Former Yellowstone Superintendent Mike Finley commended his work on the salt-baiting issue, and in 2000, Jackson was praised as "public employee of the year" by the Greater Yellowstone Coalition. That's why some speculate that since Finley's tenure in the park ended earlier this year, Jackson's outspokenness has not found favor with the new administration. "If Bob Jackson is silenced, who will be next?" asks Louisa Willcox, a grizzly bear advocate for the Sierra Club. "And who will be willing to speak up when their opinion runs counter to park administrators?" According to Ruch, there are laws against the use of federal funds to impose broad gag orders on civil servants. His organization has asked National Park Service Director Fran Mainella to investigate Jackson's case and to guarantee he will be rehired next summer. If the service doesn't, Ruch says Public Employees for Environmental Responsibility will sue. The agency, however, says that the gag order Jackson signed had nothing to do with the salting issue. 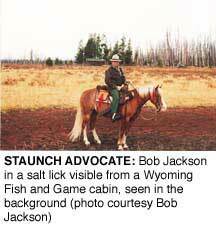 "When Bob brought the salt-baiting issue to our attention, it was good information. There is no question that, several years ago, his concerns were important," says Marsha Karle, Yellowstone's chief of public affairs. The gag order and his departure have "more to do with performance of his job, and that's more than I should say." Karle says that in Jackson's absence progress is being made on the salt-baiting issue. The Bridger-Teton National Forest is working on plans for cleaning up some of the "salt craters" left by years of baiting. Scientists, both federal and state, are studying the baiting issue. And a team from the Interagency Grizzly Bear Committee is looking at the effects of hunters on wildlife at the park boundary. Jackson says this work will probably only scratch the surface, because the state and federal agencies are unwilling to confront the outfitters responsible for the salt licks. "Outfitters have tremendous political and economic power in Wyoming. They practice salt-baiting precisely because it allows them to service more hunters per season, providing more revenue for state coffers," wrote Jackson in a letter to acting Park Superintendent Franklin Walker. Will Jackson be returned to the backcountry next summer? "Decisions about seasonal employees are made in the spring," says Karle. "No one knows what will happen next year." Jackson, meanwhile, is answering dozens of calls from reporters, talking from his home about his fears for Yellowstone. "I love Yellowstone and I am concerned about what is happening to its land and animals," he says. "I have always thought of myself as a public servant. I am proud to be one. Is it wrong to voice my concerns?" Or, you can hear an upcoming Radio High Country News report about Bob Jackson at www.hcn.org.